Linking up with Melyssa over at The Nectar Collective for Weekly Wishes! I'm back! I dropped off the map a bit these past few days, but you know what? I was okay with that, and I had a great time with Dai in LA, doing my best to leave my stress behind. You need that sometimes, you know? So, here I am with a new week! 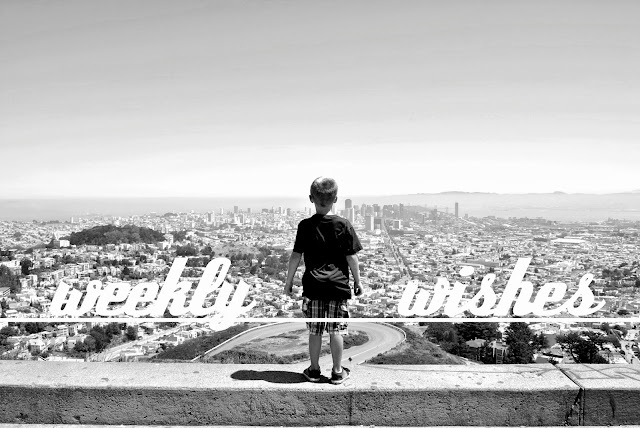 A bit late on my Weekly Wishes today, but better late than never! - Unplug from social media. This was not as successful as I would have liked, but oh well... Nothing I can really say, except that I didn't try hard enough. - Drink at least 1.5 liters of water per day. I did it! I love water. I really do. This went well and I was surprised at how easily I was able to do this. - Don't rush places I always feel like I am rushing places. I am always running late, or doing things in a hurry, and it is exhausting and stressful. Today, I was actually a little early for work and it felt great. I could breathe and relax, and wasn't worried about anything. Then I wondered why I don't do this all the time! - Read 25 minutes per day. This was one of my first goals several weeks ago, but I want to try it again. I love reading, but never make time to read things that I actually want to read. So, lets get back at this! - Do not procrastinate my essay. I have an essay due next week and for like the first time ever, I am going to do my best not to procrastinate when writing it. I always feel awful when I do this, and it is looking like I won't be able to continue this habit in my current English class, so if I want to do well, I've gotta get my act together! - Make some "me" time. I've realized that this is something that I need. I am just that kind of person. I like people for the most part, but deep down, I am an introvert and need time to myself. I don't always make this happen though, but I am going to be sure of it this week! Oh reading! That is a great goal! I need to keep that one in mind for myself. I never set aside time to read, and I always regret it. I'm loving your wishes for this week. I was totally stuck on what to do but reading yours has inspired me. Especially making time for myself. I can relate to several of these. Good luck with your goals! I have a few of these as my secret goals this week. Good luck!